Prion is a proteinaceous infectious agent that causes fatal degenerative disease of nerves. Prion can be genetic, infectious or sporadic disease. The protein is able to structurally transform a normal occurring protein into an abnormal structural protein that is transmissible to other prion proteins. They are the main cause of transmissible spongiform encephalopathies. 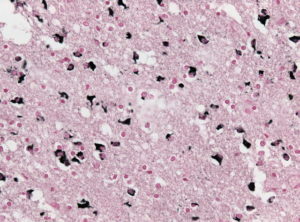 Prions cause bovine spongiform encephalopathy in cow, which is commonly referred to as mad cow disease, scrapie in sheep and are also suspected to cause chronic wasting diseasein deer. In humans, they can cause CreutzfeldtJakob disease (CJD), fatal familial insomnia, kuru and Gerstmann-Sträussler-Scheinker syndrome. 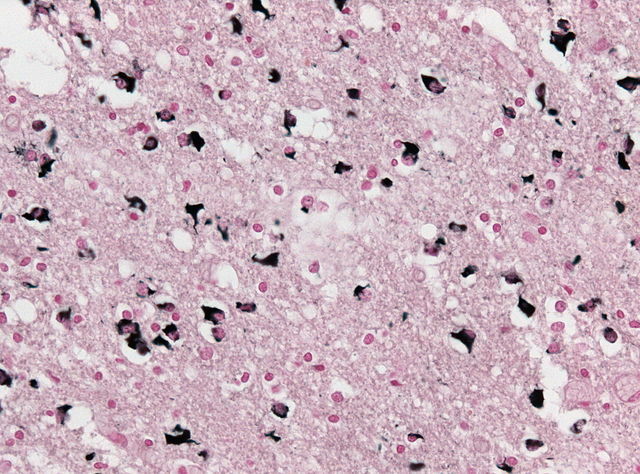 Multiple system atrophy is caused by misfolded alpha-synuclein and therefore it is also classified as a prion disease. When prions affect a healthy individual, they cause properly folded proteins to convert into amyloid form, in which proteins convert into aggregated beta pleated sheets, which accumulate which has potential to damage to the brain if accumulated in abnormal quantities. The structure of the prion protein is remarkably stable and they are resistant to denaturation. It is therefore difficult to dispose of the infectious material. The incubation period can be determined by the growth rate at which the prion proteins replicate. The propagation depends on whether the animal possesses a normal prion protein or not. Animals that do not have the normal prion protein cannot develop or transfer the disease to others. Disease can infect women and children, with the symptoms of tremors, coordination problems regarding arm and leg pain, and headache. Two London based researchers, Tikvah Alper and John Stanley Griffith, hypothesized that some transmissible spongiform encephalopathies are only caused by proteins. They also suggested that the agent causing spongiform encephalopathies and Creutzfeldt Jakob disease was not affected by radiation because the particle was too small to be hit by an ionizing radiation. Later in 1982, Stanley B. Prusiner and his team managed to isolate the protein after two years and they said that the infectious agent is purely a protein. They also stated that the prion protein can occur in a normal as well as an infectious form. This is a normal constituent of the cell membrane and mainly has an alpha helical structure. This protein form cannot be separated. Normal prion protein is said to have an important function of cell–to–cell adhesion and communication in brain. It binds to copper ions with great affinity. This is an isoform of the normal PrPc which is resistant to proteinase K and is structurally misfolded. It can or cannot be infectious. This is a structurally altered form of the normal PrPc which is always infectious and causes disease. It is discovered component for the infectious prion particles. The exact structure of the protein is still not known but it has structurally more than normal beta pleated sheets which form amyloid fibers, which eventually accumulate forming plaques. The exact function of the prion proteins is still being researched but experimental studies in mice have demonstrated that they play a role in regeneration of myelinated nerve fibers. In experiments performed on mice, it was shown that breaking down of prion proteins causes activation of myelin repair and if they are not present then demyelination occurs in those nerves. In recent studies done from 2004 to 2005, it has been hypothesized that prion proteins play a role in the maintenance of long term memory. In 2006, an article from Biomedical research institute of Whitehead showed that prion proteins are necessary for self-renewal of bone marrow. It stated that the expression of these prion proteins on stem cells in necessary for self renewal. The heterodimer model was the first one to explain how prions replicate. This model stated that when a single molecule of PrPSc comes in contact with a molecule of PrPC, it catalyzes the conversion of the normal protein into the altered form and this process continues until many molecules of defective protein are formed. Another model explains that PrPSc exists only in fibril form and this fibril form binds to the normal PrPC causing its conversion into abnormal protein. But there should be a hypothesis which explains the exponential growth and replication which is observed during the disease. This can be explained by a mathematical solution which states that exponential growth is the result of fibril growth and fibril breakage. The exponential growth is determined by the square root of the PrPC concentration. The process of prion replication has many implications in the designing of drugs for future. This can be done by designing a drug that simply slows down the rate of exponential growth because the disease progresses fast because of this exponential growth. As the incubation period is longer, a drug which will decrease the exponential growth will decrease the progression of disease. Humans: iatrogenic and variant Creutzfeldt-Jakob disease (CJD), Gertsmann-Straussler-Scheinker syndrome (GSS), fatal familial insomnia (FFI), Kuru, familial spongiform encephalopathy, multiple system atrophy (MSA)these disease are sporadic, genetic or acquired in origin. 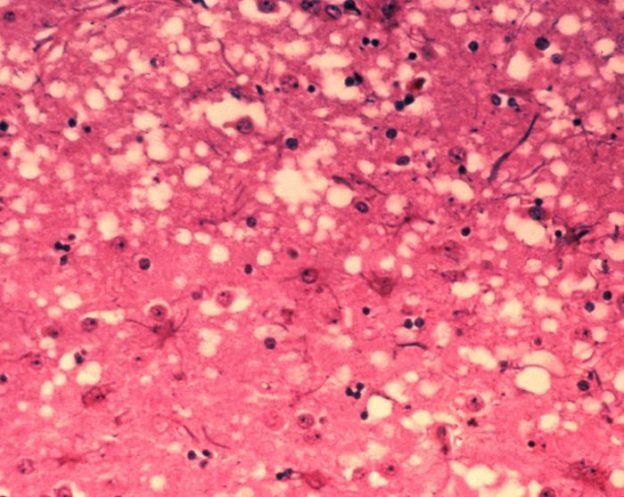 The abnormal prion proteins mimic as an infectious agent that can cause transmission of disease from one organism to human or inherited as a mutant. In general, prions are resistant to heat, ionizing radiation, formaldehyde and proteases. However, these may reduce their infectivity. Decontamination relies on hydrolysis which destroys the protein structure. This can be done by using sodium hydroxide, sodium hypochlorite and acidic detergents like LpH. Autoclaving at 134 degree centigrade for 18 minutes is found to be affective. Immersing the instrument in 1 N sodium hydroxide and place it in gravity displacement autoclave for 30 minutes at 121 degree centigrade. Then take the instrument out and rinse with normal water and clean, repeat the routine sterilization process. Immerse in 1 N sodium hypochlorite for 1 hour, rinse with water, place in heat in gravity displacement autoclave at 121 degree for one hour. Immerse the instrument in sodium hydroxide or sodium hypochlorite for one hour, rinse with water, then transfer into gravity displacement autoclave (121 degree ) or in a porous load (134 degree) for one hour, clean and perform routine sterilization procedures. Antibodies against PrP have shown some promising effects. Antibodies against PrP were used in prion infected mice and they were treated successfully under specific conditions. Gene silencing is another method still under trial in which genes causing prion disease are stopped or turned off. Stem cell therapy is another proposed therapy for the treatment of prion diseases. It can be used to make new brain cells against the damaged brain cells. Astemizole is found to have anti-prion activity that can cross blood-brain barrier and inhibit the activity of prion.